Marking an editorial milestone, Cadalyst editors interview the author about his newsletter and how CAD management has evolved over the decades. 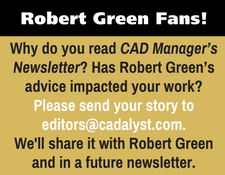 Editor's note: Cadalyst is thrilled to be celebrating 400 issues of Robert Green's CAD Manager's Newsletter! This installment marks 18 years of newsletter success, thanks to Green's practical, approachable, invaluable advice and the readers who follow him loyally. We are incredibly grateful to have Green on the Cadalyst team. Thank you, Robert, for your devotion to Cadalyst and for the excellent content you've delivered year in and year out. We know readers would agree: CAD management wouldn't be the same without you! To mark this special occasion, we turned the tables and interviewed the author himself. We hope you enjoy this "behind the scenes" insight from Green as much as we did. Here goes! 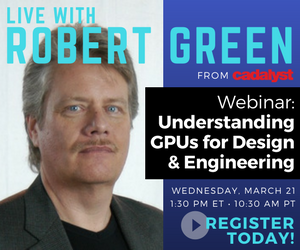 Robert Green: I want to address the topics that confused me in my own CAD management job many years ago. I want to convey that CAD management success requires both technical and managerial prowess. I don't have all the answers, but I always hope to motivate, inspire, and provide useful ideas that help others become more effective CAD managers. Over the years, you've authored a variety of CAD management-related content. What was the impetus for launching the CAD Manager's Newsletter in particular? Standards, hands down. Standards are relevant to everything a CAD manager does, from problem identification all the way through implementation and training. And, selfishly, if you don't standardize operations, you'll just spend all day fighting fires. As is typically the case, Robert Green (seated at center) draws a full house to his CAD management presentation, this one at Synergis University 2014 in Allentown, Pennsylvania. I'd say to honestly assess where you have a skills weakness, then read through the relevant materials to beef up proficiency. Think of your CAD management skill set as a chain and focus on the weakest link. Keep doing this and you'll find success coming your way. 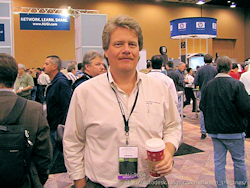 Green circulates at Autodesk University, where his CAD management classes are perennial favorites. During your career, what's changed about CAD management and what hasn't? Well, almost everything about the software, hardware, networks, and information distribution methodologies has changed. When I started as a CAD manager, CAD tools ran on MS-DOS or on a proprietary UNIX workstation of some sort, networks were largely Novell servers, and interoffice e-mail was brand new. If an individual had e-mail — which was unusual — it was typically via the CompuServe Information Service, which was popular at the time for hosting online "bulletin boards," including most software support forums. Contrast that reality with today's graphical Windows/iOS operating systems, massive high-bandwidth networks, and universally available Internet support resources — well, you get the picture. LACCD Sets BIM Standard on Largest Bond Construction Program in the U.S.